Technology has afforded us many luxuries in today’s world, especially in the interview and hiring process. People can now be interviewed remotely via Skype or Facetime, Google Hangouts, etc. It is just as important to convey a professional attitude and presentation of yourself, perhaps even more so in this setting. And minor failures like not setting up your end of the Skype interview professionally, can lose you a job. If you don’t have a Skype account and don’t have a camera and haven’t ever really chatted via Skype, don’t tell the hiring manager! Do what you can to get up to speed. If your computer doesn’t have a camera, purchase an external one – cheap and easy to install. If you don’t have a Skype account, create one and download the app to your computer. 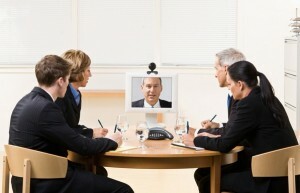 Skype video interviews are more and more commonly used. A technically savvy candidate is a plus, so present yourself this way. Google is your friend! Everything and anything you need to learn more about is searchable on the Internet. There are instructional videos available on YouTube for pretty much everything nowadays. Having interviewed hundreds of people via Skype, I’ve seen everything in terms of quality of presentation. Make sure it is a distraction-free space that is quiet. Remember, you are mocking up an “in-person interview” and helping the hiring manager make this happen smoothly. I had interviews where the person was practically in the dark, like a convict who didn’t want to show his face. When the person hiring has to take the time to help get the lighting right, it’s a waste of time. Also, do what you can to have a very serene organized, minimalist background in the frame. If you have clutter and a wall of family photos and a big bulletin board filled with stuff… either move it or pick another wall. Stage your interview correctly. Dress professionally, at least from the waste up! (you can wear your PJ bottoms if you really need to be comfortable), but a shirt and tie for men or a nice blouse for the ladies. Dress professionally, if anything over dress! Do a little homework and gauge the company culture you’re interviewing for. If it is a young, modern company culture then you wouldn’t wear a tie. But the women should still wear a clean blouse. If it is a more traditional office culture then ties for men and blouse and jacket for the ladies. Treat the camera as the person you’re speaking with. Look at the camera. On the other end of the Skype call, it will translate as if you’re looking at the person you’re speaking with.